US buyers will need to wait for the A45 sedan to arrive. 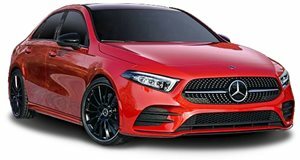 Mercedes-AMG has only just lifted the wraps off the A35 sedan, which has arrived with 302 horsepower and 295 lb-ft of torque to take on the Audi S3. That makes it the fastest version of the new A-Class currently available in the US, but AMG is wasting no time teasing the upcoming A45 hot hatch. After demonstrating the A45’s drifting abilities on asphalt last Christmas, AMG has released a new teaser video showing a pair of tail-happy A45 prototypes dancing on ice and snow in Sweden. It’s a very impressive display of sideways action that Ken Block would be proud of, made possible thanks to the car’s dedicated drift mode that utilizes the car’s unique 4Matic all-wheel-drive system and tweaks the ECU to make the A45 kick its tail out with ease. So far, we know the A45 will be powered by an updated version of AMG's turbocharged 2.0-liter four-cylinder that will reportedly produce 383 hp in the base version and 416 hp in the range-topping S variant. All that power will be sent through an eight-speed dual-clutch automatic transmission. The current AMG A45 is limited to a top speed of 155 mph and can hit 62 mph in 4.2 seconds, so the new models should have faster acceleration times. The hotter S model could also have a higher top speed of 168 mph. Neither the A45 or A45 S made an appearance at this year’s 2019 Geneva Motor Show, so we’re expecting the two hot hatches to debut at the 2019 Frankfurt Auto Show in September before hitting showrooms in 2020. Sadly, America will be deprived of this incredible hot hatch since the A-Class hatchback isn’t sold in the US, but we will eventually be getting an A45 sedan equivalent. Mercedes doubles down on small cars with a winner for technology.